warm salad | "blackberry-eating in late September"
I don’t know about you, but when I get home from vacation I feel at once heavier and lighter. Lighter, because the toil of dragging overnight bags jammed with clothes, a laptop, a camera bag, two backpacks, a cooler, a sun hat, hiking boots, a satchel bristling with electronics, a grocery sack full of road snacks, a suit bag of dress clothes for a wedding, another satchel, this one loaded with supplies spanning the randomness quotient from shampoo to a day-planner (seriously, how can we have this much stuff??? ), and the leash of a dog intent on smelling every single thing she’s never smelled before from parking lot to hotel room to parking lot every other night is finally over. Heavier, because even though I didn’t cook much, I sure ate a lot. Plus, there’s that whole emotional withdrawal from the glory of vacation, but mostly I’m just shallow enough to be talking about my waistline. In any case, upon our return from a trip we typically plan out a few particularly virtuous meals to combat the quantity of food we consumed, and the dubious quality of some of those choices – road food is always, alas, simultaneously necessary and a bit specious (take, for example, the Milky Way I bought at a gas station in Coos Bay to help myself stay away for the remainder of the drive to Brookings, which turned out to be open on one side. I threw it away. And then I almost cried). Simple rice and steamed broccoli is one of our go-to homecoming meals. Whatever can be scraped together from the garden and eaten with a light dressing and curls of Parmesan cheese is another. 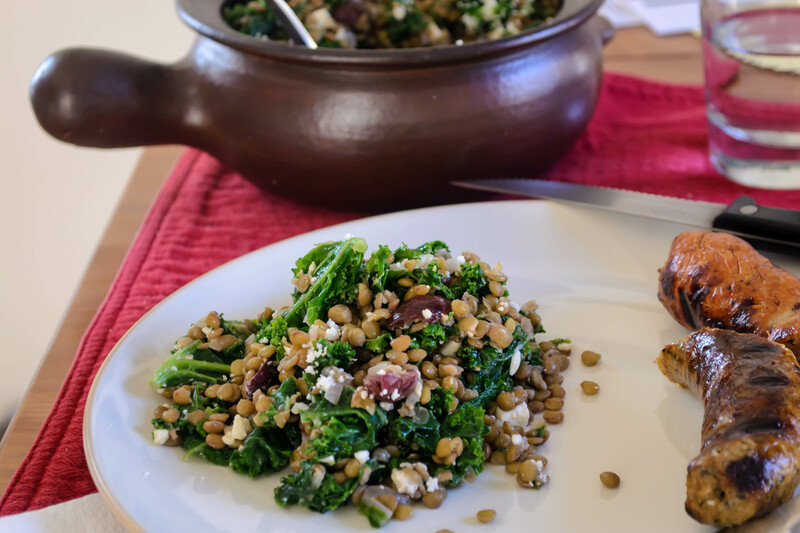 But now we have a third, which might also become a side for roast chicken, a working lunch, or a base for seared tuna or poached salmon: a warm salad of lentils, tossed with lightly blanched kale, briny kalamata olives, and the tang of feta cheese. A few days after our return, with pantry and fridge freshly stocked, I considered my starch choices. We eat a good bit of pasta and a fair amount of rice, but our consumption of legumes and pulses is way below par. This had to change. I picked out a bag of green lentils that had slowly been pushed to the back of the shelf as new and more exciting boxes were set in front of it. Lentils are great for us. They are packed with fiber and protein and folate, which all make them filling as well as nutritious. But like most dried beans, on their own they just aren’t very exciting. They call for additional flavors and textures: chilies or acid or salt, crunch or freshness. Herby sharpness. Crumbly cheese. A dance of textures. You see where this is going. To give them as much of a fighting chance at flavor as possible, I sautéed some onions and garlic before tumbling in lentils, water, a lone bay leaf, and a bracing hit of red wine vinegar. “And salt,” you’re surely crying, but no! Salt should be added to lentils only near the end of cooking. It can toughen them if you add it right away. I’ve also read that acidic ingredients – like the red wine vinegar I used – can contribute to this toughness, but I didn’t notice any particularly virulent refusal to soften, so I wouldn’t worry too much about it. You want your lentils to be fully cooked – that is, not crunchy – but to still retain a bit of texture. 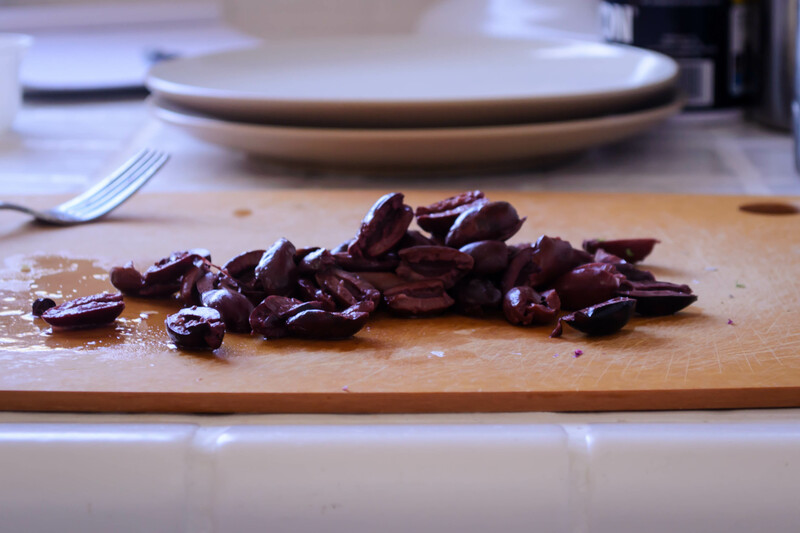 They should soften but not fall apart into mush – taste a few to be sure they have achieved the level of tenderness you like, but be sure to do a good sampling – five or six – as isolated beans can cook at different rates. Once done, add salt to taste, let them cool a bit, and then the magic happens, and it’s such easy magic, it’s worth doing any night of the week. Torn pieces of blanched kale, cubes of feta, and halved kalamata olives. A drizzle of olive oil if you think it’s on the dry side. Faced with this combination – salty, chewy, crisp and fresh and soft – we scooped spoonful after spoonful, and ended up eating most of the pot. So much for virtue. Heat the 1 TB olive oil in a medium pot over medium heat. Add the onions and garlic and sweat them gently for 3-5 minutes, until the onion pieces are translucent but not vigorously browned. Add the lentils, water or broth, red wine vinegar, and bay leaf, but not the salt. Salt added at the beginning of cooking can toughen the lentils. We’ll wait to season them until they have cooked. Turn up the heat and bring the pot to a boil, then reduce the heat to simmer the mixture for 35-40 minutes. After 35-40 minutes, the lentils will have sucked up most of the liquid in the pot and they will be tender but not mushy. You want a slight bite of resistance to remain. Add the salt, stir well, and then pour out the pot into a colander or strainer to drain off any remaining liquid. Pick out the bay leaf so there aren’t any unwelcome surprises later. Set the colander of lentils aside to cool. Meanwhile (if you are proactive, or in the same pot you just used, if you are lazy like me), bring a pot of salted water to a boil. Add the 4 cups of kale and cook for 1-2 minutes, until the leaves are intensely green and barely tender. 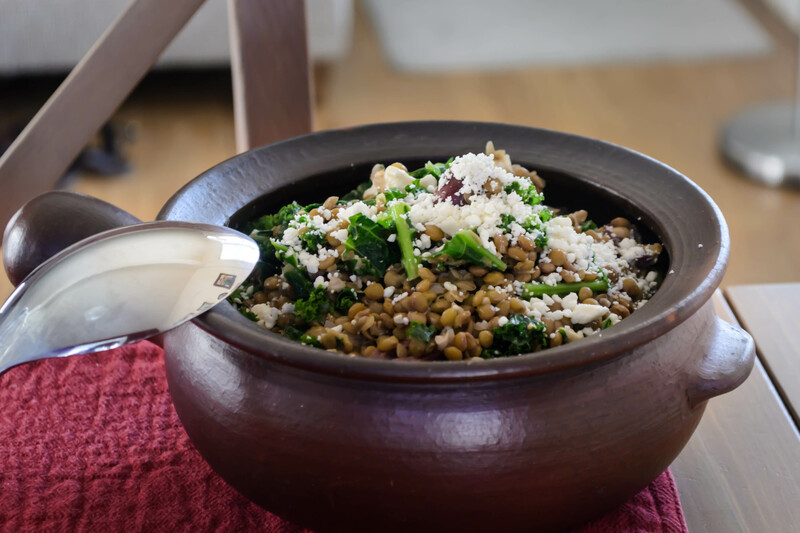 Drain the kale into the same colander as the lentils. Cool until just warm, or completely to room temperature as desired. 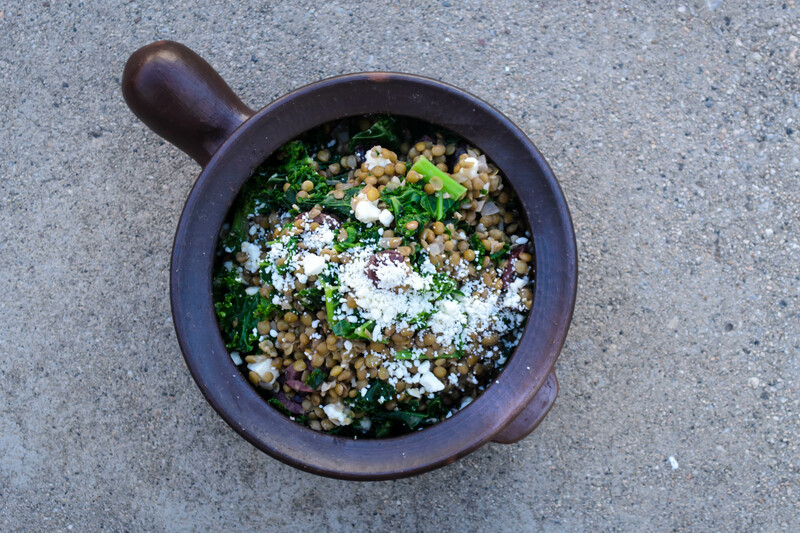 While kale and lentils are cooling, halve your olives and crumble your feta. 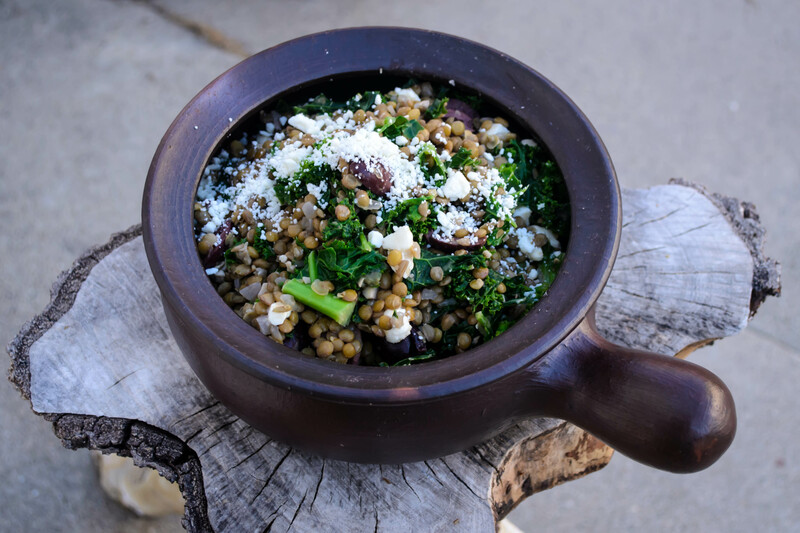 When the lentils and kale have reached your desired temperature, add the olives and feta and toss to combine. If the salad seems dry, add a splash of olive oil to moisten things up a bit.